In 1913, E.A. Dunlop with the aid of D.P. 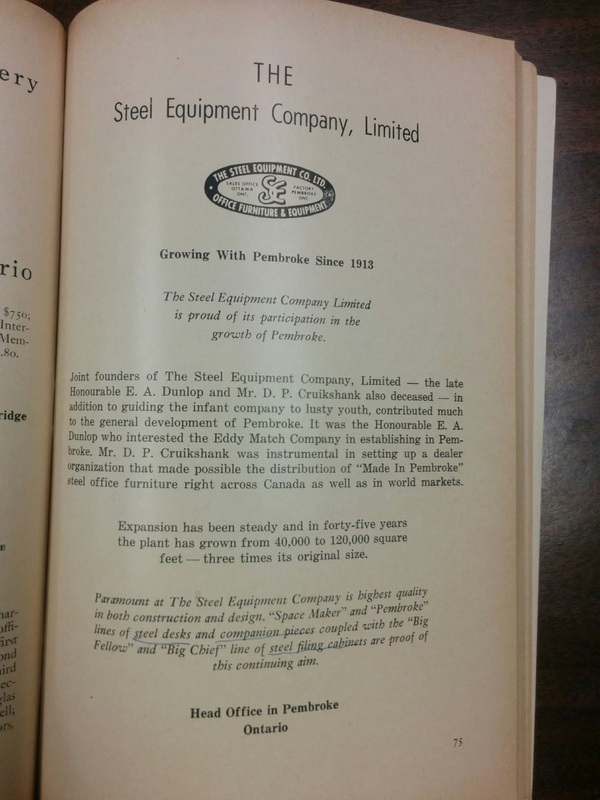 Cruikshank established the Steel Equipment Company in Pembroke. 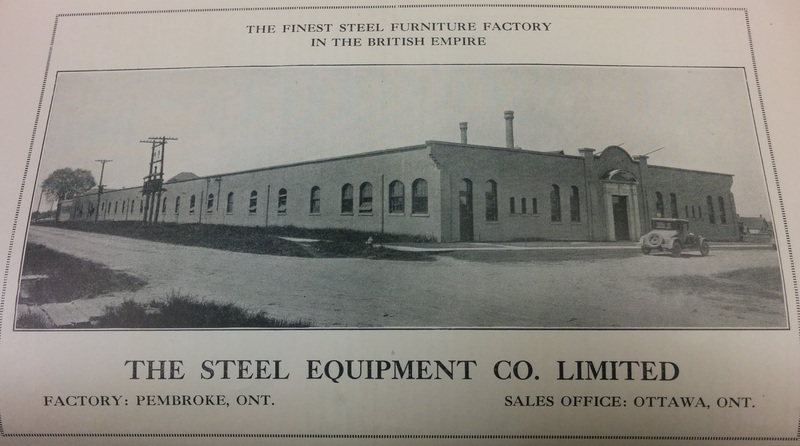 The company produced steel office equipment - from filing cabinets to desks and chairs at their plant on Steel Street off of Forced Road near the Shook Mills plant. 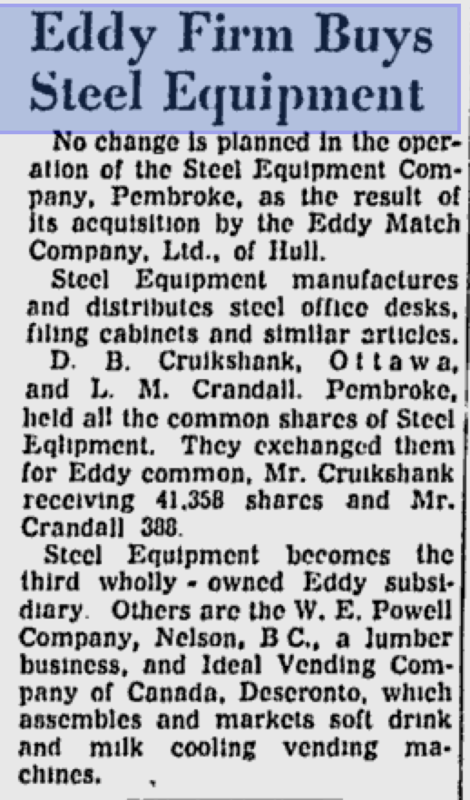 In January 1957, Eddy Match Company announced it was purchasing Steel Equipment. Eddy Match had recently expanded to produce wooden matches and industrial equipment. Steel Equipment retained its workforce and continued to manufacture steel office furniture. On August 14, 1958, over 130 workers at Steel Equipment, unionized under the United Steel Workers of America, went on strike. The workers requested wage increases of 16 cents per hour over several years and paid vacation time. The strike continued for a month as negotiations over wage increases failed. On September 13, the union agreed to a 7 cents per hour increase in wages and the strike ended. What's in a name? Stor/Wal! 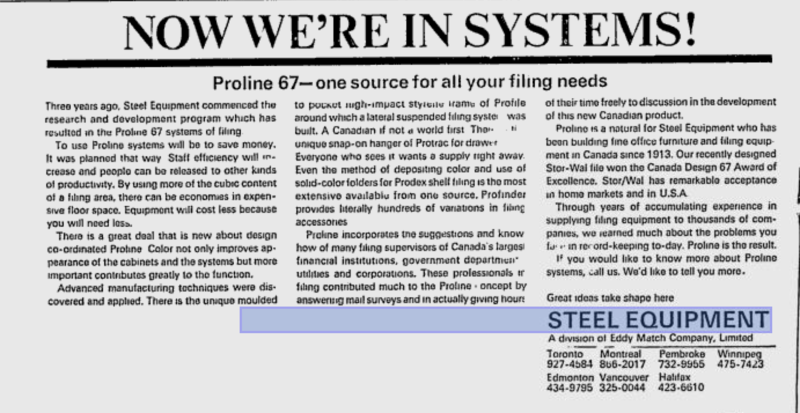 Stor/Wal was the name of a successful filing system. Steel Equipment's predecessor company, Storwal International would be founded a decade later. On March 24, 1969, 177 workers at Steel Equipment went on strike. The union negotiated with management for an increase in wages and better benefits. Negotiations continued for several weeks before an agreement was made and wages were increased. Work resumed on April 14, 1969 and over 170 workers went back on shift. Toward the end of the 1970s, Steel Equipment operated two plants: one at their original location on Steel Street and a new factory on Olympic Drive. Steel Equipment became Storwal International and began to transition to the new plant. Today, KI continues to manufacture steel office equipment on Olympic Drive.